JONESBORO, Ark. 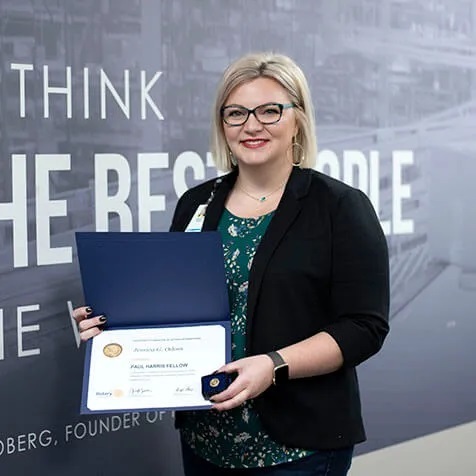 — Hytrol Employee Training Specialist Jessica Odom has been named a Paul Harris Fellow by the Rotary Club of Jonesboro. The club recognized her for outstanding contributions to the organization and Jonesboro community in a meeting Oct. 25. Odom has been a member of Rotary since 2017 and serves on their Board of Directors and as chair of the program committee, scheduling speakers for the club’s weekly meetings. Last year, she chaired the silent auction for the Pot O’ Gold fundraiser and raised nearly $4,000 for community projects. Rotary is a global network of 1.2 million neighbors, friends, leaders, and problem-solvers who see a world where people unite and take action to create lasting change – across the globe, in our communities, and in themselves.